Beyond supplying power to the circuits, an important function of a DC/DC converter is safety assurance. Newer DC/DC converter ICs incorporate virtually all protective features that are deemed necessary, including user-adjustable functions, such as threshold levels, to accommodate various conditions. Also, the CPU, FPGA, and other devices driven by multiple power supplies operate based on power-on sequence, timing, and other specifications. The power supply circuits need to accommodate those conditions. To this end, power supply ICs with a built-in sequencing function are available. The protective and sequencing functions provided in an IC can also be implemented using external circuits. However, such an approach requires a significantly more complex circuit design than power supply and many additional parts, which may not be a realistic option. This section presents an overview of representative protective and sequencing functions. “Thermal shutdown” refers to a mechanism whereby the operation of a circuit is shut down when the junction temperature for the IC reaches the maximum rating, or closely below or above the Tj max. The junction temperature at which the function is triggered, different for each IC, is set just below or above the Tj max. After a shutdown, the IC takes operation either by auto-restart or latching. In the auto-restart type, the IC shuts down when the temperature rises to a pre-set threshold level and the IC automatically resumes operation when the temperature declines to a set level. In the latch type, the IC operation remains shut down even when the temperature falls to a set level. Thus to resume the operation, the IC needs to be explicitly powered on again. Which operating mode after these two types of shutdowns is to be selected depends upon the type of safety design to be provided in a given application. Incidentally, because Rohm’s ICs have a Tjmax of 150℃, most of them trigger a thermal shutdown at that level plus 25℃, or 175℃. As an important reminder, the thermal shutdown function is intended to prevent any fumes generation or ignition in the IC itself in the event of a malfunction; it is not a function designed for the board or system to which power is supplied. The under voltage lockout function (UVLO) shuts off any output from the IC when the input voltage falls below the acceptable input voltage range for the IC, to protect the IC’s output transistors and the load. If the input voltage falls below the operating voltage for the IC, the circuit behaves erratically, and UVLO forces a circuit shutdown before the IC produces any abnormal output. 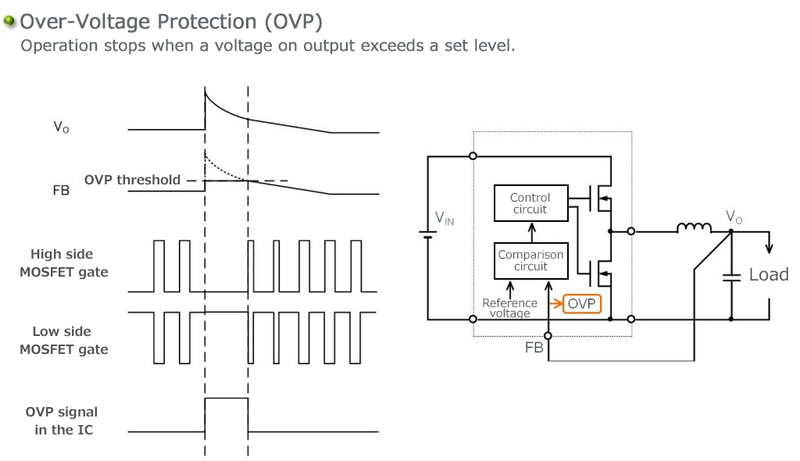 UVLO, designed to prevent unanticipated problem, is integrated into most power supply ICs. The over-current protection function limits the output current to prevent the IC or the load from burning when an output current exceeding a preset level is found to flow. By monitoring the amount of current flowing through an inductor and detecting that a preset level is exceeded, the function limits the current by reducing the on-time for the high side switch and sending the output voltage to a lower level. 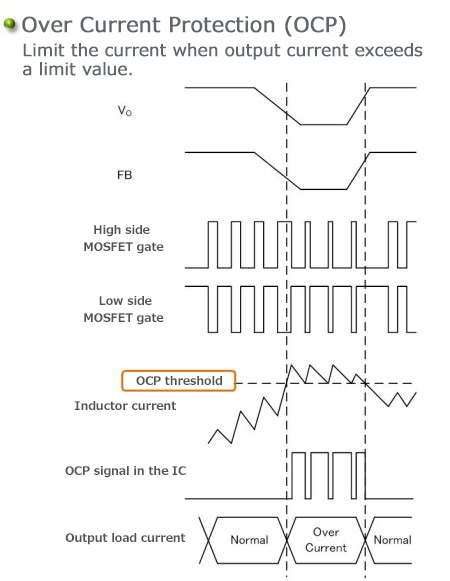 If the over-current state persists, the IC continues to limit the current. In such a situation, remember that the limited current, that is, the over-current, continues to flow to the load. When the current level returns to normal, the operation of the IC also returns to normal. In some ICs short-circuit protection, mostly employed in pairs with over-current protection, is identified as part of the over-current protection function. If the over-current, described above, increases further, the protective circuit reduces the output voltage even more. 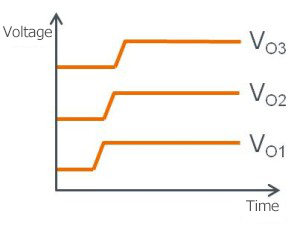 If the voltage remains below a set level for more than a certain amount of time, the protective circuit shuts off the switching operation, reducing the output to zero. This protective function is also of two types: auto-restart and latching. In the auto-restart type, the switching operation is resumed after hundreds of milliseconds, and produces a voltage output. Normal operation is restarted when the cause of the over-current is eliminated, and any over-current stops flowing at this point in time. If the over-current condition returns, the output repeats in shut-on/off cycles. In the latching type, the output is retained at a zero level, and the condition is not resumed until the power for the IC is reset. As in the case of thermal shutdown, which type of protective function is to be employed must be selected depending upon the type of safety design to be provided in a given application. If a power line shorts for some reason, causing a large amount of current to flow, and when the operation is restarted, the output voltage can instantaneously overshoot. In such a situation, because CPU kind ICs only have a small safety margin in operating voltage and absolute maximum rating, the over-voltage during the overshooting condition can ruin the ICs. The over-voltage protection function monitors the output voltage and, when detecting a voltage exceeding a set level, turns off the high side switch and shuts off the supply of power. However, because merely shutting off the supply of power leaves unattended the problem of a continued rise in voltage due to the release of charges accumulated in the inductor, the function turns on the low side switch, and releases the charges in the inductor to GND to arrest any further increase in voltage. The shutdown function turns on/off the operation of the control circuit in the IC. If the circuit does not need any power, the Point of Load (POL: a power supply unit exclusively for a part of the board or a device) approaching performs a shutdown in tandem with a request from the load. This contributes to reductions in power consumption or standby power requirements. Soft start refers to a function, designed to prevent the occurrence of any on-rush current at startup. This ensures that the output voltage rises only slowly by providing a time constant. 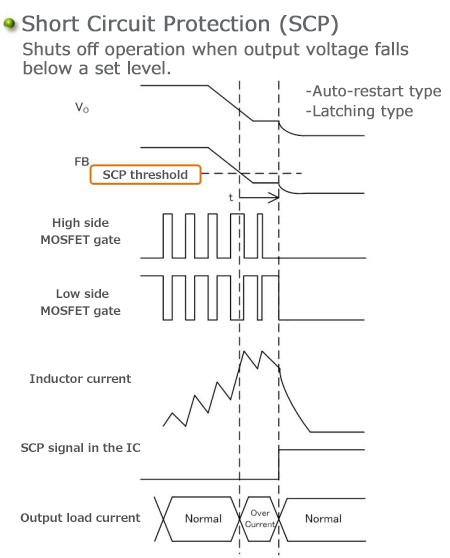 Remember that an on-rush current triggers the over-current protection function of the IC, preventing the power from starting properly (latched-off condition). The time constant used by the soft start function is of two types: one that is fixed internally in the IC and one that can be set by means of an external capacitor with an adjusting pin. Power-good is a function that raises a flag when the output reaches a set voltage level. This function notifies the CPU that the power supply has started up without any problem. Additionally, it can be combined with the enable function to construct a startup sequence for multiple power supply units. Figure 57 illustrates an example of building a sequence in which supplies from 1 to 3 are started, through the use of power-good and enable functions. Tracking refers to a function that can set the sequence and timing at which multiple power supplies are started. The starting of the outputs from multiple power supplies in a specified sequence ensures the safety of circuits and devices. Tracking has three types: coincident tracking, ratiometric tracking, and offset tracking. In coincident tracking, all power supplies are turned on simultaneously; they start at the same slope, and reach a set voltage in ascending order of voltages. This feature is useful in applications where the core supply with a low voltage must be started first, followed by peripheral I/O power supplies, as in the case of an FPGA. In ratiometoric (proportional) tracking, power supplies start at different slopes. This method is designed to adjust the slopes so that no large on-rush currents flow into the decoupling capacitors on the respective power lines. 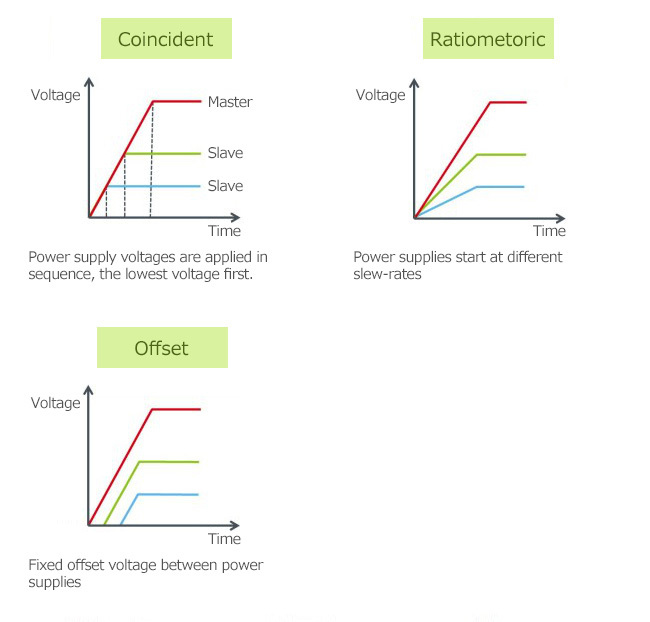 In offset tracking, power supplies are started by maintaining the fixed offset voltages (voltage differences) between the power supplies. This method is useful for devices that are governed by requirements regarding the difference between power supply voltages. To conduct these controls, sequencer ICs and tracking controller ICs are generally used. Some power supply ICs have a built-in tracking function. In these devices, the slave is controlled through the use of the output voltage of the master power supply unit. ・Each function is implemented in an IC; some ICs, however, lack these functions. ・A solid understanding is needed as to whether a protective function protects the input side, output side, or the IC itself, and what operations are performed by the function. ・Simple sequencing is performed by a built-in function in the IC; for complex sequencing, separate ICs are available.